The cheapest among the rest of O Plus new smartphone release, but of course cheaper means less specs. Anyway its not just about the specs, O+ Android phones are proved to be durable and has long lasting battery. Price wise, since it will only cost Php2,995 while having similar specification on its line up. The only downside I can see here is the screen, 3.5-inch is quite small specially nowadays. But that would not be a problem for non-power users. A simple surf, text, and call, plus a little entertaiment. And not to mention O Plus Air Shuffle technology which you can control the phone without touching its screen, a unique feature for a cheap Android Smartphone. 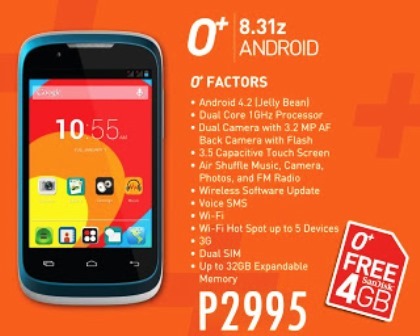 O+ 8.32z is priced at Php2,995 and comes with free 4GB Sandisk Micrd SD memory card.